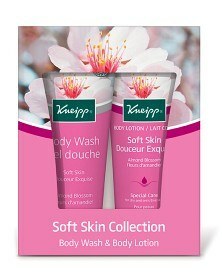 Presentförpackning med Kneipp Soft Skin Almond Blossom duschkräm och bodylotion. Almond Blossom duschkräm med mandelblom har en skyddande effekt på huden redan vid duschen eller badet. Innehåller mandelolja och jojobaolja. Är pH-hudneutral och passar för torr och känslig hud. Almond Blossom hudlotion med mandelolja och vårdande ingredienser av avocado och jojoba återfuktar huden och ger en skyddande effekt mot uttorkning. Går snabbt in i huden och gör huden smidig och len. Passar torr och känslig hud. 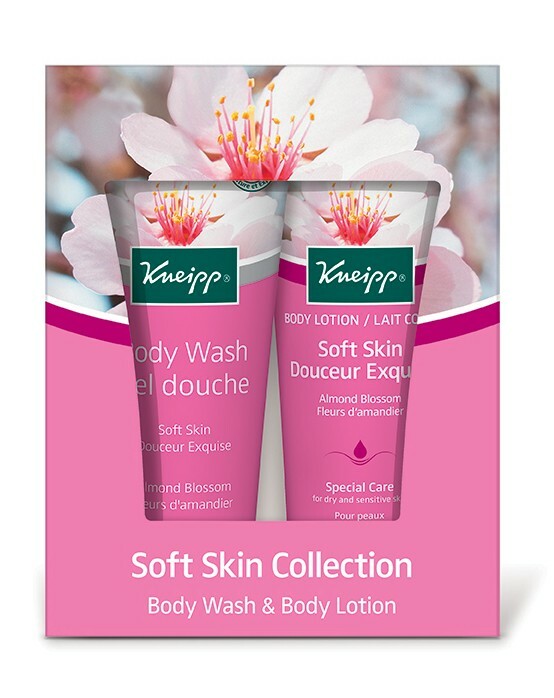 Body Wash Almond Blossom - Soft Skin: Aqua (Water), Sodium Laureth Sulfate, Glycerin, Cocamidopropyl Betaine, Coco-Glucoside, PEG-40 Sorbitan Peroleate, PEG-18 Glyceryl Oleate/Cocoate, Glyceryl Oleate, Prunus Amygdalus Dulcis ([Sweet Almond]) Oil, Simmondsia Chinensis (Jojoba) Seed Oil, Butyrospermum Parkii (Shea Butter), Prunus Amygdalus Dulcis ([Sweet Almond]) Flower Extract, Amyris Balsamifera Bark Oil, Pogostemon Cablin Oil, Bulnesia Sarmientoi Extract (Guaiacwood Oil), Benzyl Benzoate, Limonene, Linalool, Coumarin, Alpha-Isomethyl Ionone, Sodium Levulinate, Sodium Anisate, Parfum (Fragrance), Helianthus Annuus Hybrid Oil, Glycol Distearate, Hydroxypropyl Methylcellulose, PEG-14M, Sodium Hydroxide, Silica, Tocopherol. Body Lotion Almond Blossom - Soft Skin: Aqua (Water), Prunus Amygdalus Dulcis ([Sweet Almond]) Oil, Glycerin, Tocopheryl Acetate, Cetearyl Olivate, Cetearyl Alcohol, Butyrospermum Parkii (Shea Butter), Panthenol, Sorbitan Olivate, Prunus Amygdalus Dulcis ([Sweet Almond]) Flower Extract, Retinyl Palmitate, Citrus Aurantium Dulcis (Orange) Peel Oil, Bulnesia Sarmientoi Extract (Guaiacwood Oil), Pogostemon Cablin Oil, Limonene, Linalool, Coumarin, Citronellol, Geraniol, Citral, p-Anisic-Acid, Parfum (Fragrance), Caprylyl Glycol, Xanthan Gum, Acrylates/C10-30 Alkyl Acrylate Crosspolymer, Arginine, Helianthus Annuus Hybrid Oil, Tocopherol.